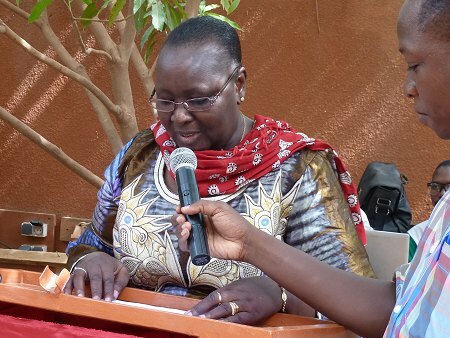 Rakieta Poyga, founder of the Association Bangr Nooma, at the inauguration of the centre for the protection of girls and women against violence in Ouagadougou (June, 2015). Photo: © TERRE DES FEMMES In westafrican Burkina Faso more than 70% of the girls and women are affected by female genital mutilation/cutting (FGM/C) according to estimates of the World Health Organization (WHO). Rakieta Poyga cannot remember her own circumcision. But when she gave birth to her daughter, she nearly died from the effects. Now she is fighting against this tradition in Burkina Faso – successfully. She is the founder of the organization „Bangr Nooma“, which means: „There is nothing better than knowledge“. The campaigns of Bangr Nooma last for several years and appeal to girls and women, boys and men, midwives, traditional and religious dignitaries as well as circumcisers. The former circumcisers play a decisive role, since they hear about a planned mutilation and can report it to the police. In Burkina Faso the mutilation of girls and women has been legally forbidden since 1996. Despite that the practice is still secretly performed in rural areas as well as in the wildly built suburbs of the capital Ouagadougou. Rakieta Poyga started her fight against FGM/C together with five other women from the capital of Burkina Faso. After a short time she expanded the campaign to her home village und neighbouring villages. She was convinced: „If I can manage to convince the people there, I will make it everywhere.“ She made it. Since Bangr Nooma was founded, the organization reached more than 800.000 people with the awareness raising campaigns in Burkina Faso. In that way more than 33.000 young women were saved from the mutilation. Since the end of 2016 Rakieta Poyga is the patron of the CHANGE Plus project. With her long-standing experience and committment to fight against FGM/C she is the perfect patron for the project. Therefore we are very happy that she supports the project with her knowledge and extraordinary engagement in the fight against FGM/C. Rakieta Poyga already proved that it is possible to change the mentality of the people regarding mutilation. This change can only be achieved through long-term, continuous work. Rakieta Poyga leaves no doubt that she has got the courage and the power to continue this fight. When she was first asked to be the patron of CHANGE Plus, Fatoumata Siré Diakité immediately accepted this request, saying that she would be honoured to support this project which perfectly matches her own desire to end FGM. In fact, Fatoumata Siré Diakité is not only the former Ambassador of Mali in Germany and a highly decorated public figure, but she is also a famous women’s rights activist. She is the founder and director of the Malian organisation called “Association pour le Progrès et la Défense des Droits des Femmes” (APDF, Association for the Progress and the Defence of Women’s Rights), which is working to support girls and women whose lives are affected by violence. APDF keeps two shelters, one in Bamako and one in Mopti, where girls and women can find refuge, counselling, medical help and the possibility to learn new income-generating skills. All these services help girls and women to live independently and free from violence. In Mali, 89% of girls and women are affected by FGM and 73% think that the practice should continue, which is why the fight against FGM is particularly important for Fatoumata Siré Diakité. Her personal fight against the practice of FGM often took place with great violence, especially from fundamentalist Islamists in Mali. Despite Fatwas pronounced in Mosques against her person, following death threats and physical, verbal and psychological assaults from local authorities and medias, she has never been discouraged. Despite all opposition, Fatoumata Siré Diakité and her organisation APDF never stopped campaigning against FGM since its foundation more than 25 years ago. Fatoumata Siré Diakité’s commitment to ending violence against women is not limited to Mali alone. As head of APDF, she is the regional director of the “African Coalition on Traditional Practices and the Empowerment of Women” (ACTPEW), aiming to create a safe society in Africa and the diasporas where women and girls live free from harmful traditional practices. One of the networks most prominent goals is to stop the practice of FGM. For all these reasons, we at CHANGE Plus count ourselves very lucky to have Fatoumata Siré Diakité as our patron. The project will benefit a lot from her expertise, long-standing experience and seemingly infinite energy.